Todd McFarlane's Spawn movie is getting a massive boost to its talented roster, in the form of one of the biggest names in the visual effects business. With Spawn's production on the horizon, ComicBook.com can exclusively confirm that The Walking Dead's Greg Nicotero, and his KNB EFX Group, will provide the visual effects for the upcoming film. McFarlane, who created the iconic Image Comics character, will write and direct the new live-action movie with Jamie Foxx set to star in the titular role. The creator has worked with Nicotero on several projects over the years, including the first Spawn movie back in 1997. With a smaller budget to work with, McFarlane is focusing on practical effects, rather than heavy CGI, which is what led him back to Nicotero and KNB. "When I conceived of the story to start with, I never really thought of it as big special effects extravaganza because I knew we weren't going to have the budget for it," McFarlane told ComicBook.com. "So I knew I was going to rely heavily on practical makeup and costuming, and one of the places that kept popping up was my good pal Greg Nicotero on his KNB Group. And he's obviously done a tremendous amount of work on dozens and dozens of movies. The sort of serendipitous part of it is that Greg was there at the beginning 20 years ago for the original Spawn movie." "I've been friends with Todd since we did the original Spawn, and the guy's just a genius," said Nicotero. "I love the way his mind works. He thinks very, very graphically. I know he really loves the idea of Spawn being dark, and I love the animated show. It's just a really great opportunity for us to get a chance to collaborate again." Though the duo designed a live-action look for Spawn more than two decades ago, McFarlane is adamant that things will be much different this time around. "​I think it would be a mistake for people to go, 'Oh, it's going to look like the first movie.' No. That's not the task nor is that sort of where we're at creatively," he confirmed. "So when I sat down with Greg and his staff, I just said, 'Here's what I see visually.' I gave them some reference at some images throughout the 25-year history of Spawn that I thought was close to what I was talking about. And then I just stepped back and let them start taking a whack at it." "Each time they sent me something, I would then draw over it and go, 'Hey. How about a little bit of this, a little bit of that?' And then I thought very quickly we actually got to our look of what it is that we want to go at. KNB came out of the gate, showed me a wide, wide range of looks. I was able to narrow it down," McFarlane added. Nicotero is no stranger to working with major comic book properties. 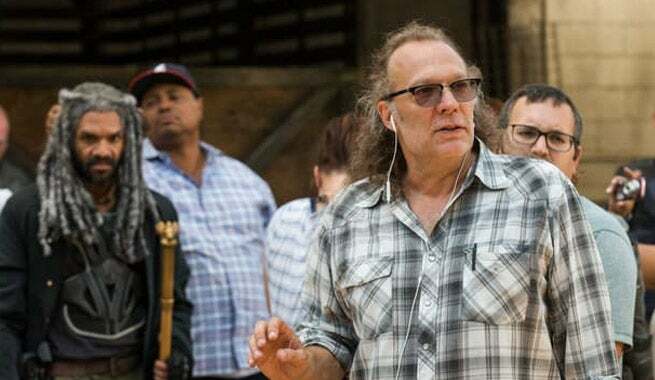 In addition to his work as a special effects supervisor, producer, and director on The Walking Dead, Nicotero has also done worked on live-action adaptations of Preacher and Sin City. "Spawn has always been a fascinating character study, and I really think that Todd's whole take on this is he really wants to be able to define superhero movies in a very different context than everybody is accustomed to," said Nicotero. "He really is the perfect guy to do it because he knows exactly how much he wants to see. He always liked that Spawn was kind of like the boogeyman, you know?" "It was a really fun ... We spent about six weeks coming up with some concept art, and designing the character, and a lot of it was kind of getting to the roots of what he's about. He's this sort of part feral animal, driven completely by this rage that he has, and he really embraced the idea of getting the sense of how much we want to see of this character, and what we want the audience to see. It's always the situation where you give the audience at times glimpses of things to allow them to put things together in their minds, and I think there's a very specific way that Todd wants to build these impressions of what Spawn is, and what he looks like by starting out with some kind of simple, very evocative imagery, and flashes. One minute he's there, and the next minute he's not. Kind of cool stuff," Nicotero added. McFarlane's Spawn has yet to receive a production start or release date, though the director is preparing to meet with studios to potentially release the film. As is stands now, McFarlane is hoping to have cameras rolling by early 2019. Are you looking forward to the new Spawn movie? Let us know in the comments!